When you visit our area this summer, you need to go on a Boothbay Harbor, Maine Puffin Cruise. This fun activity is only offered from to June to August and offers visitors an educational and exciting way to learn about one of Maine’s most unique species of wildlife. Puffins are a penguin-like bird that you won’t find anywhere else in the country. That’s because Maine is the southernmost place puffins live in North America. These small birds, which are just 10 inches tall and as light as a can of Coke, have an interesting history in Maine, and one that you’ll learn all about on a Boothbay Harbor, Maine, Puffin Cruise. Find out more about great things to do in our area by requesting a copy of our free Vacation Guide. It has the best recommendations like taking a Boothbay Harbor Maine Puffin Cruise. If you traveled back in time to the late 1800s, you would only find two puffins in the entire state of Maine. Except for these two solitary puffins, which were protected by a lighthouse keeper, all others had been killed for their meat and their beautiful feathers. In the 1970s, however, puffins returned to Maine. Thanks to Project Puffin, several young puffins were brought from Newfoundland and raised on the Maine Islands, in hopes that they would migrate and then return in maturity to mate back in Maine. They did, and now there are at least 250 puffins on Eastern Egg Rock, Maine. When you set sail from Boothbay Harbor on your puffin-watching cruise, you’ll embark on a wonderful and exciting adventure to Eastern Egg Rock. Often compared to going on a treasure hunt, you can’t anticipate what might turn up during the cruise. You may encounter seals sunning themselves, huge Minke Whales swimming by, or a number of different kinds of birds flying overhead. However, it is certain that you will experience some of the most scenic landscapes on your way to Eastern Egg Rock. You’ll pass miles of stunning shoreline dotted with historic lighthouses. Then, when you arrive at Eastern Egg Rock, you’ll slowly circle the 7-acre island, keeping an eye out for the puffins who call the area home. 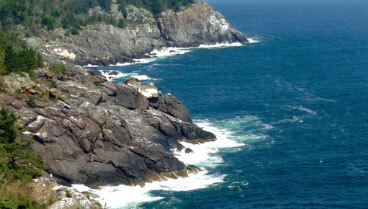 Cap’n Fish’s Audubon Puffin & Scenic Cruises offers the best Eastern Egg Rock puffin tour in Boothbay. While each and every tour offers a slightly different experience, depending on the time of the tour and activity levels of the wildlife. Nonetheless, each tour is fun, informative, and well worth attending. During the tour, you’ll enjoy the terrific scenery, unique wildlife, and a lovely afternoon on the water. Puffin cruises are only in the summer, during the warmest months of the year. At other times of the year, Cap’n Fish offers whale watching, seal, lighthouse, and harbor tours. 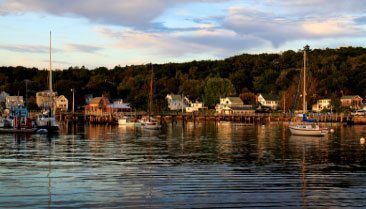 Explore Boothbay Harbor and Stay with Us! A puffin cruise is just one of the many great Boothbay Harbor cruises to enjoy during a stay with us at Topside Inn. Our beautiful inn is located in the center of town near the docks from where the best harbor tours depart. When you stay with us, you’ll enjoy a short 5-minute walk to Boothbay Harbor’s best shops, galleries, restaurants, and things to do. 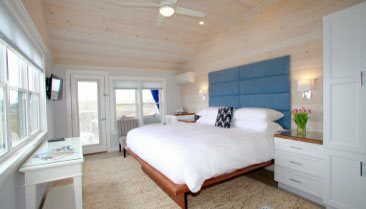 In addition, our property features stunning views of the harbor from three well-appointed and historic lodging options to choose from. Whether you stay in the Main House, Windward Guest House, Leeward Guest House, or our private Water’s Edge Cottage you’ll enjoy spectacular scenery, modern amenities, and all the comforts you’re looking for in a home-away-from-home. 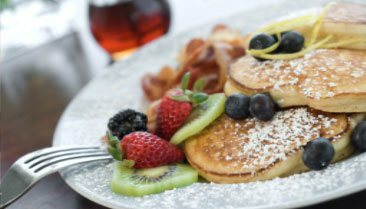 Each morning at Topside Inn starts with a homemade breakfast that has earned recognition for being one of the best bed and breakfast offerings in the country. It features an every changing menu filled with local ingredients, seasonal specialties, and homemade sweets and jams you’ll love. And in the evening, our guests enjoy returning to our property in time to watch a gorgeous Maine sunset from their room or from the inn lawns. Learn more about our inn today. Then, contact us and start planning your next trip to Maine!